When I set out to post daily on the subject of daffodils, little did I know how distracting this week’s almost perfect gardening weather would be. The opportunity to spend two unbroken days outside rarely comes along and I have gardened from dawn to dusk. In the course of the last 48 hours, planting bulbs and rejuvenating borders, I have been enveloped by the scent of hyacinths, serenaded by bees and danced for by a solitary butterfly. This I have enjoyed in the company of our resident doves, Daphne and Dudley. They are becoming tamer and tamer by the day, almost eating out of my hand. If only they would build a decent nest there could be a whole family of them at The Watch House. 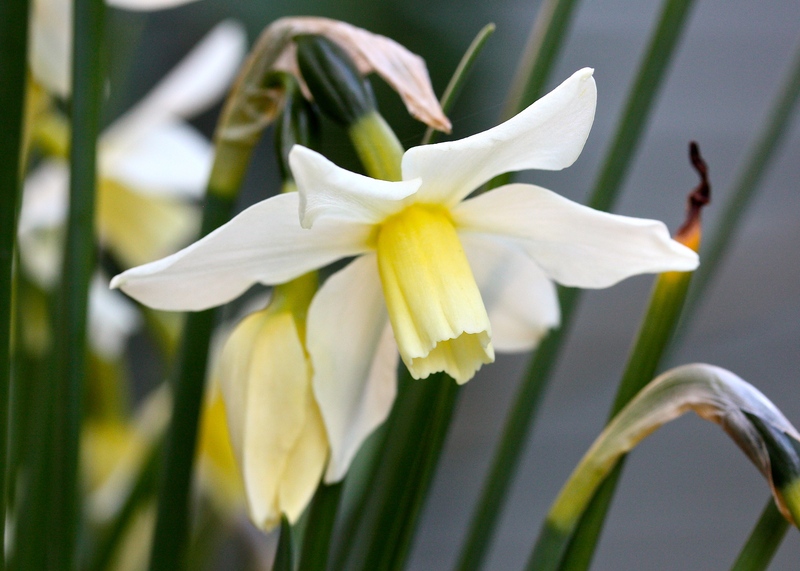 Narcissus ‘Toto’ began flowering when it was just 4 inches tall, but has experienced a dramatic growth spurt this week. The bulbs have come into their own in the warm sunshine, throwing up stems bearing two, three or four flowers. The blooms deserve a companion planting of blue scilla, chinodoxa or muscari to bring out their curds and whey colouring, not the sugary pink cyclamen I foolishly paired them with. I will know better next time. 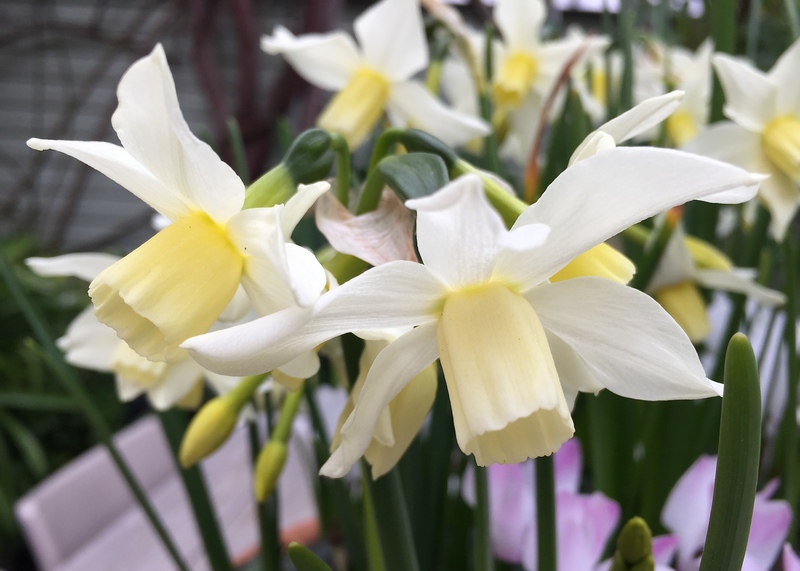 Their fragrance is not as intoxicating as Narcissus ‘Cragford’ or Narcissus ‘Minnow’, but is pleasing enough if you get your nose in there. Honoured with an Award of Garden Merit by the RHS, Narcissus ‘Toto’ ticks all my boxes and will definitely be on my bulb order again this summer. Your photo has sold me on the merits of this Narcissus. Such a beautiful narrow cup and arched neck. Really great. Thanks Dean – ‘Toto’ has some lovely qualities. I am glad I was able to capture them. Being so pale it was not easy to photograph. I’m a bit of a lazy bulb buyer so tend to go for what’s on offer…so ‘Toto’ seems a very good idea for next year! Thanks! I both plan ahead and succumb to what’s on offer, which usually means I end up with way too many bulbs! I love Toto. Although it doesn’t seem to like my garden. Thalia tends to stick around for me, so that’s what I plant instead. We didn’t get snow last night, but I’m a while away from seeing some daffodils yet. I finally have some crocuses, but they didn’t open yesterday because of the lack of sun.